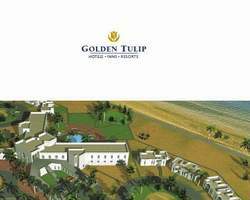 The Golden Tulip Resort, Dibba is ideally located on the east coast of the Musandam Peninsula, 60 kms from Fujairah, on the Indian Ocean.The hotel is located in Dibba on the east coast of the Musandam Peninsula, on the indian ocean. Easily accessible once in Dibba, by following the signs of the hotel. The Golden Tulip Hotel Resort Dibba offers 54 rooms and suites, tastefully decorated, and a range of cafes, and restaurant, bars, to cater to all needs. a sea view conference room, and a range of recreation facilities, ideal for a great escape. All the rooms of the hotel are tastefully decorated, with balcony and sea view. the rooms have complete amenities, satellite television, interconnecting, airconditionned. The main restaurant in the hotel International CuisineCappuccino cafe; located in the hotel lobby, with all day dining. Our conference room benefit from a sea view, and day light, with 12 x 12 meters, ideal for around 100 persons in theatre style, and 35 persons in U shape.